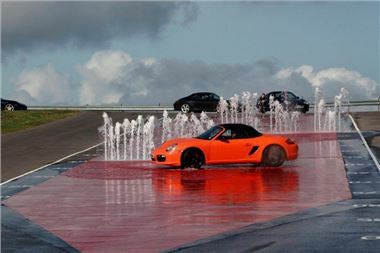 The IAM, the UK’s leading independent road safety charity, is holding a young driver skills day at Silverstone Porsche centre on 15 May 2011. The day will involve a series of driving activities designed to challenge and improve young driver’s skills in a safe and fun environment. Features such as the ice hill descent will be used to enhance the young drivers’ skid control experience, and participants will go out on the track to develop the principles of defensive driving, cornering, observation skills and overtaking. “After passing the driving test there is currently no requirement to take any further driver-development training. In road safety terms, this confines 17-25 year-old drivers – who suffer (proportionally) the greatest number of deaths and injuries – to improvement by trial and error. The IAM launched Momentum; a new two-part assessment for the younger driver at the start of the year. Momentumis designed for 17-25 year olds who have passed their driving test, and incorporates two modules: an interactive online assessment, followed by an on-road session with an IAM examiner. Momentum does not involve an exam and there is no risk of failure; it offers a quick, low-cost option for improving the confidence, awareness and safety of younger drivers. Places on the young driver skills day are only £199, which includes lunch. For more information please visit www.iam.org.uk/momentum. *The Austrian system of post-test training ensures that new drivers have at least three further contacts with qualified instructors during the first 12 to 18 months of their driving career. There has been a 30 per cent drop in young male driver fatalities following implementation od this scheme. After taking the test an initial assessment drive is undertaken to gain knowledge of a driver’s experience and to highlight any deficiencies. This is followed by a visit to a Road Safety Centre to demonstrate handling in the wet, speed into corners and the impact of speed on stopping distances. There are also discussion sessions, which take a psychological approach that involves talking about peer pressure and the main risks to young drivers. The final element is an eco-drive assessment. IAM is the UK’s largest independent road safety charity, dedicated to improving standards and safety in driving, motorcycle riding and cycling. The commercial division of the IAM operates through its occupational driver training company IAM Drive &amp; Survive. The IAM has more than 100,000 members in the UK and Ireland. It is best known for the advanced driving test and the advanced driving, motorcycling and cycling courses. Its policy and research division offers advice and expertise on road safety.